This is a real original - a crime drama based on a novel by John Creasey (writing as JJ Marric) that was shot in England by western maestro John Ford, and which barely got noticed at the time. Though produced in colour as Gideon's Day, only black-and-white prints were shown in America, where the film was known as Gideon of Scotland Yard, though they were later restored. 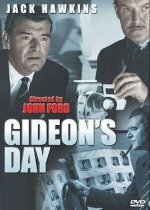 This cynical romp is extremely entertaining and contains a marvellous performance from Jack Hawkins as the Gideon of the title, who is followed by the camera on what must be the busiest day of his life. Hawkins was the only British actor to star for the three greatest American directors of their day: William Wyler in Ben-Hur, Howard Hawks in Land of the Pharaohs and Ford here.